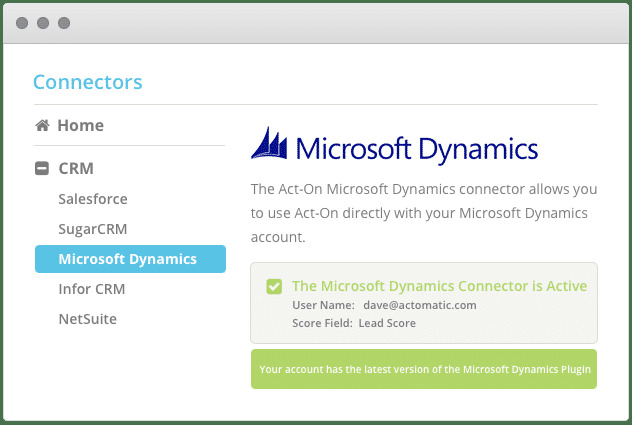 Act-On enables you to take control of your marketing campaign instead of relying on developers with its easy to use landing pages and forms. 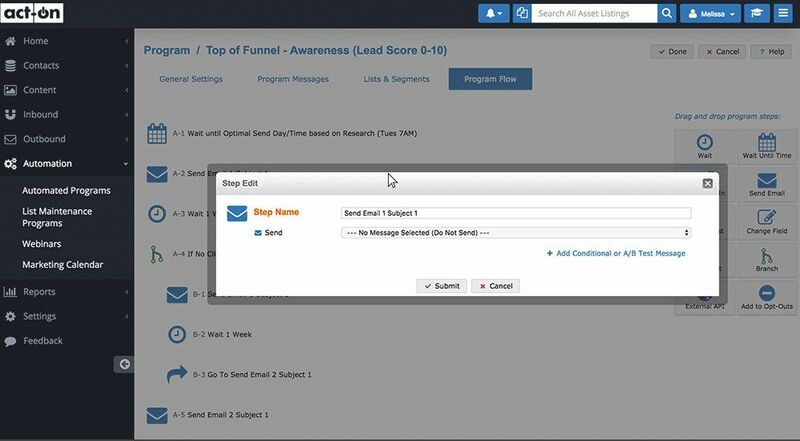 Its lead scoring and lead nurturing tools help you convert leads into prospective customers. Conduct A/B testing between your messaging strategies and get to know which one is the most effective. With Act-On’s intelligence tools, empower your sales team to close out more and more deals. Its SEO tools help your website draw more visitors which might turn out to be your prospective clients. The Act-On marketing automation software maintains your brand’s standard while maximizing the outreach of its message. How much does Act-On cost ? 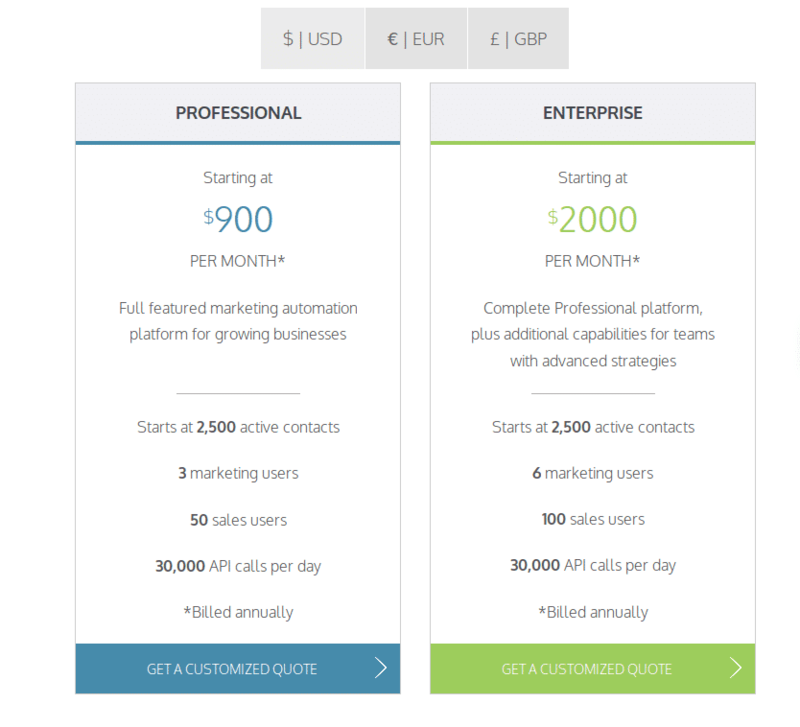 The pricing for Act-On starts at $900.0 per month. Act-On has 2 different plans such as - Professional at $900.0 per month and Enterprise at $2000.0 per month. The Pricing is starting from $900 Per Month Billed Annually. 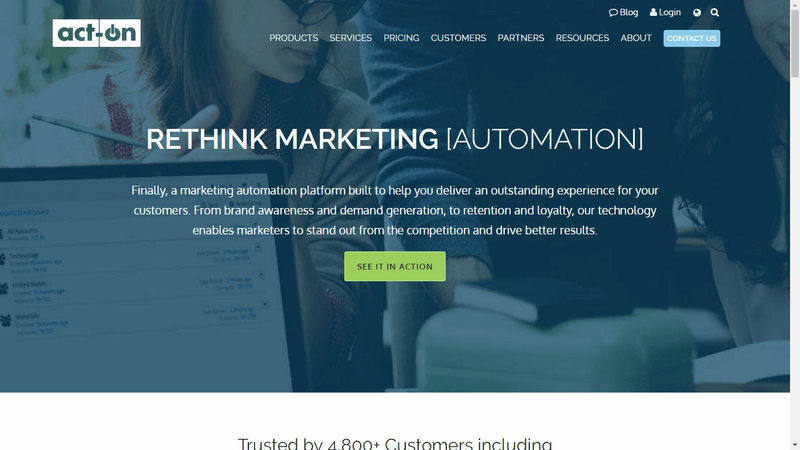 Full featured marketing automation platform for growing businesses. 30,000 API calls per day. Please Contact the Organization for getting a Customized Pricing. The Pricing Plan in Starting from $2000 Per Month Billed Annually. Complete Professional platform, plus additional capabilities for teams with advanced strategies. 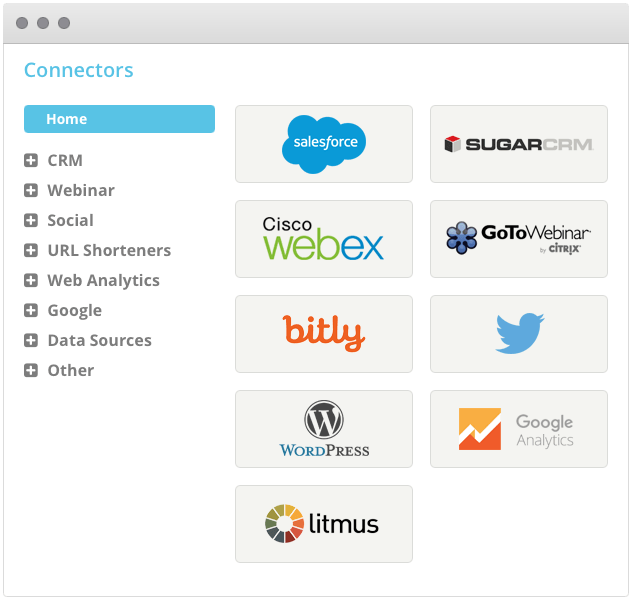 Cons: Not as many integrations as available as other platforms, but not necessarily holding us back. ""A vital apparatus to manufacture effective promoting efforts."" Follow up on's mechanization stage is instinctive, I like the manner in which the menu is assembled, it's been made in a legitimate request with the goal that when you move starting with one area then onto the next, you go down the intelligent way to fabricate computerization. The help group is extraordinary, they're proficient and persistent ! There are numerous approaches to discover answers and tips; the Act-On people group, the Act-On college, the web based instructional classes, the online classes, everything is made for us to effectively learn and productively utilize the stage. 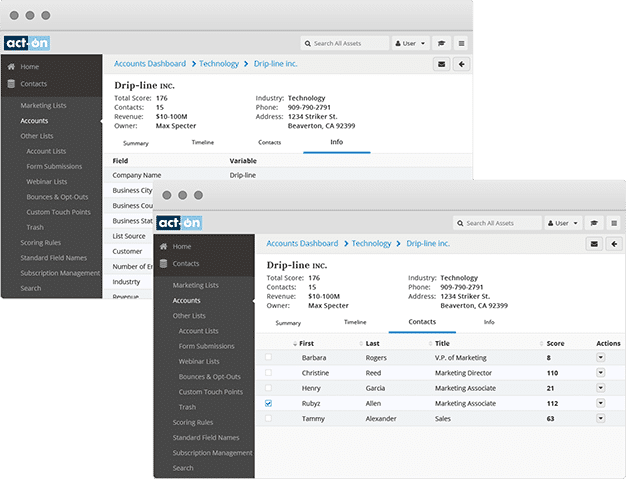 When utilizing computerization projects to refresh the crm I might want to have more control on which fields in the CRM I might want to refresh. At this moment its confounding. Likewise the documentation for the APi is frail. To others considering Act on, I would state it is an exceptionally powerful and proficient program for monitoring mailing records, messages sent, and every one of that information that accompanies that. It is commonly extremely simple to utilize, even with little involvement in programming this way. In spite of the fact that not generally the quickest program, it has numerous highlights that make it emerge for information following. Presently by utilizing the API at whatever point we promotion classes to our framework an email crusade is consequently assembled and sent to our customer database in acton. Additionally any individual who is as of now enrolled for a course is autmatically put into a concealment list so they don't get the messages for that class. 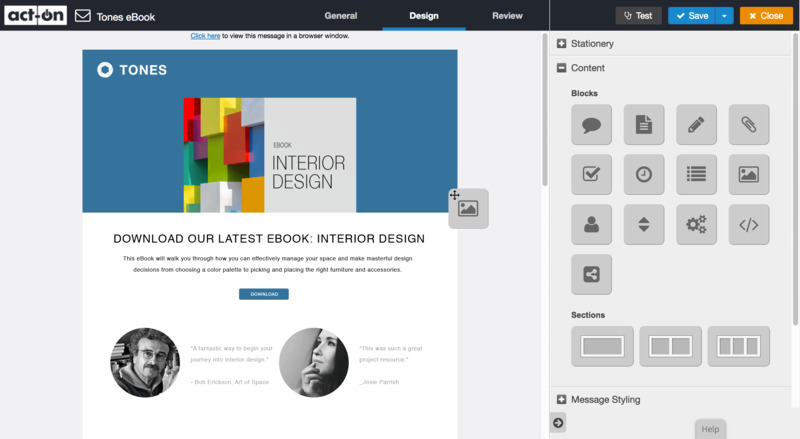 "Easy to use intuitive design with excellent support"
Ease of use to create and test emails. Drag and drop feature of sections is nice. Can be slow to find images. Will sometimes take up to a minute for image folders to open and populate. Give it a try. You wont be disappointed. Very simple to use, saves time setting up and scheduling emails over other clients I have used. Very easy to train others, including interns on how to use properly. 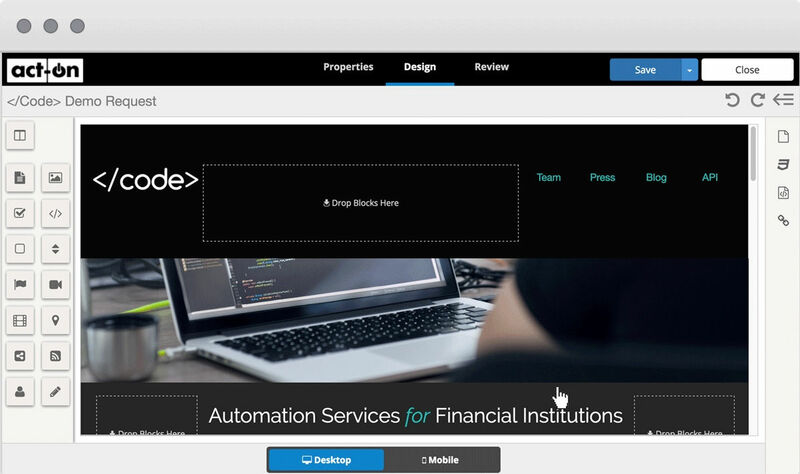 Set up automations with ease. 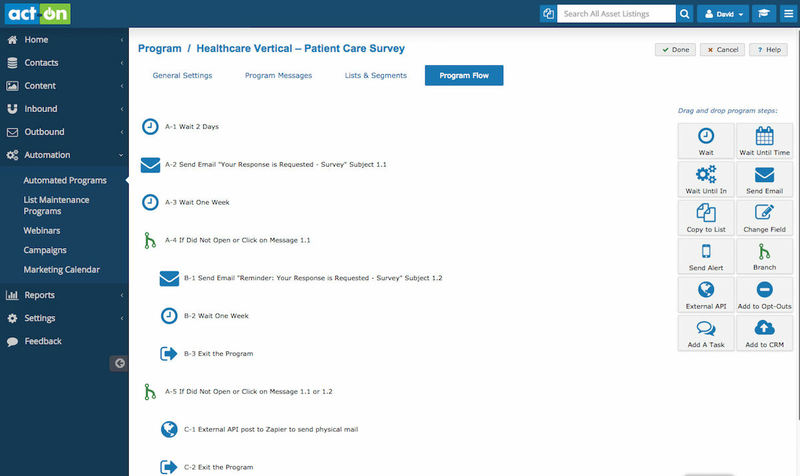 It has a good interface for looking at reports and top level results. You can dig down to see the basic KPI’s for your email marketing campaigns. There are better interfaces for less money out there. Nothing exceptional about the offerings. Or unique value. We used them for marketing email deployments. Act-On was very easy to use as a beginner to email marketing. It had a lot of really great connections you could make to your website that connected your data not just from your emails but also as your contacts engaged with your landing page or website. It was very basic. That can be a good thing too, not too many bells and whistles to confuse you. There are other email services that are slicker and have a nicer interface but I liked the natural interactions with it. Take your time in setting up the system. There are many ways you can set up the administration parts and it is best to evaluate your needs before implementing. Setting up my companies first email marketing automation and unsubscribe management systems. 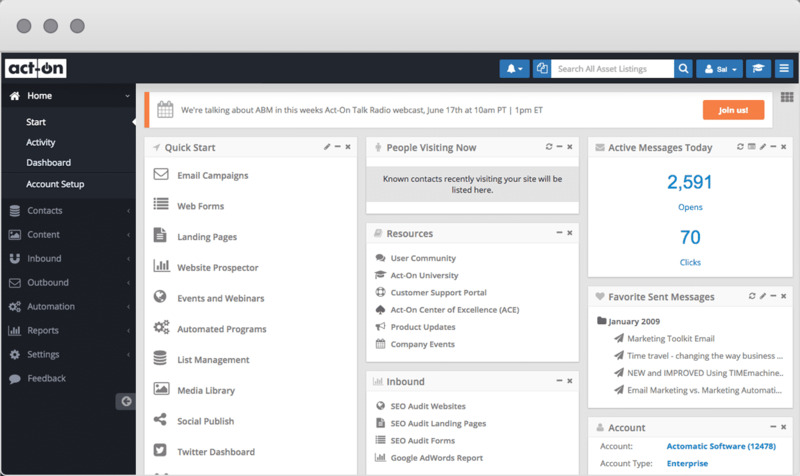 I like that act on is an easy to use marketing automation software for lead generation . I dislike that it is sometimes hard to get a hold of my representative.
" Act-On tool that allows to generate marketing campaigns." I like that It offers organic complements with social media and social marketing tools. uses an "expression generator" that allows you to choose rules to segment the clients of your website based on their behaviors. 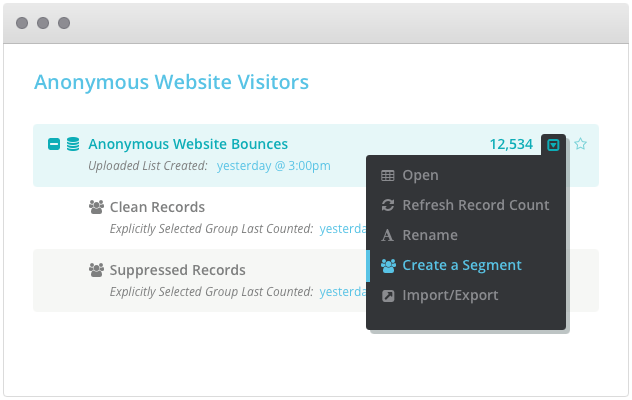 You can save the segment for future campaigns based on future site visits. Great is its comprehensive marketing automation designed to offer a complete set of applications. I think the customer service could have been better and the configuration requirements and steps are a bit complicated. It is recommended to create and optimize campaigns, generate leads, rate and prioritize prospects. 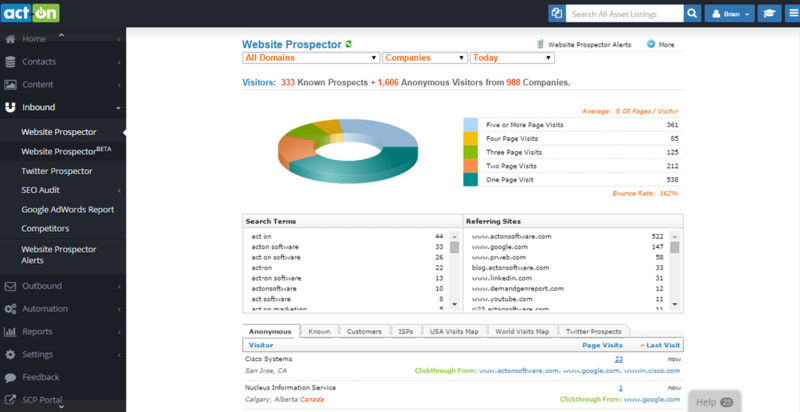 and track the recipient's commitment, such as openings, clicks and visits to websites. Our organization uses Act-On and it benefits us because it gives us the ability to configure automated email programs and send thousands of emails to the prospects of our clients. Also to implement marketing campaigns by email to generate leads for advertising agencies and marketing services companies.